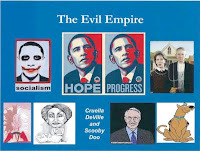 The Republican National Committee (RNC) gave Civility Project founder Mark DeMoss back to himself as an “ego-driven” donor, motivated by “Fear,””Reactionary” sentiments, tchotchkes and lurid cartoon characterizations of the Obama administration. A Southern Baptist whose public relations firm was founded in 1991 “to serve Christian organizations and causes,” and who is a top Republican donor, DeMoss, was caught between his party and the civility he has persistently advocated. As will others who share his views, DeMoss responded to Politico’s report of the RNC fundraising appeal by backing away. “I’m afraid the presentation is representative of a culture and mindset within the Republican National Committee,” DeMoss, a past member of the RNC’s “Eagle” program for top donors who gave the party $15,000 in 2008, wrote in the letter to Steele, which he shared with POLITICO. (DeMoss hasn’t given this cycle.) “Consequently, I will no longer contribute to any fundraising entity of our Party—but will contribute only to individual candidates I choose to support . . . The sort of behavior displayed in Boca Grande only contributes to the widespread cynicism of politics in general and our Party in particular. It is, in my opinion, indefensible and destructive.”. In a “This Week” exclusive interview, McConnell told guest anchor Matthew Dowd that he “can’t imagine why anybody would have thought that was helpful.” McConnell wouldn’t say if someone at the RNC should be held accountable for the presentation. “I don’t run the RNC. That’s up to them. But I don’t like it, and I don’t know anybody who does,” the Minority Leader said.